This chapter introduces the effort of developing a digital library (DL) curriculum by an interdisciplinary team from Virginia Tech and the University of North Carolina at Chapel Hill. It presents the foundations of the curriculum building, the DL curriculum framework, the DL educational module template, a list of draft modules that are currently developed and evaluated by multiple experts in the area, and more details about the resources used in the draft modules and DL-related workshop topics mapped to the DL curriculum framework. The use of information systems such as DLs is increasing in education and businesses. To better-support their users, DLs must include both a well-organized underlying architecture and a set of services designed to address their potential users’ information needs. For this vision of the future to come to fruition, information professionals need to be educated to establish and manage digital libraries. The proposed curriculum framework provides a firm foundation for these important educational activities. Modern societies are producing and consuming an enormous amount of information every day. The need for quality organized information has been growing rapidly. Various digital libraries (DLs) (Arms, 2000; Fox & Urs, 2002; Lesk, 1997; Lesk, 2005; Witten & Bainbridge, 2003) have been developed to address this need. 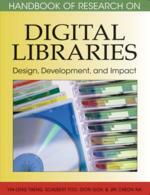 However, additional focus on education for people who design and administer digital libraries is needed. We can begin to solve this problem through development of curricular recommendations for digital library education. Several disciplines have an interest in the development of a graduate-level curriculum for digital library education; hence it can be argued that this effort must be interdisciplinary in order to be successful (Kajberg & Lørring, 2005). In particular, computer science and information and library science have been actively developing courses and programs in this area (Ma, Clegg, & O’Brien, 2006). Efforts to date have been locally-based and dependent upon specific institutional needs. The current effort takes a broader view, in order to develop a curriculum framework that will be useful across institutions and across disciplines. This framework is based on analyses of the ACM/IEEE-CS Computing Curriculum 2001 (Joint Task Force, 2001), the 5S framework for digital libraries (Gonçalves, Fox, Watson, & Kipp, 2004), papers presented at recent DL conferences and published in D-Lib Magazine (Pomerantz, Wildemuth, Yang, & Fox, 2006c), the readings assigned in DL-related courses (Pomerantz, Oh, Yang, Fox, & Wildemuth, 2006a), and a survey of digital librarians about their job responsibilities (Choi & Rasmussen, 2006a, 2006b). The ACM/IEEE-CS Computing Curriculum 2001 (CC2001) (Joint Task Force, 2001) covers a variety of areas in computer science, including information management. In turn, the area of information management includes digital libraries as one of its 14 components (including such areas as information models and systems, database systems, data modeling, transaction processing, information storage and retrieval, and hypertext and hypermedia). The CC2001 goes on to identify a number of topics that should be included in a course on digital libraries. These topics include: “Digitization, storage and interchange; Digital objects, composites, and packages; Metadata (Daniel & Lagoze, 1997; DCMI 2006, http://www.dublincore.org), cataloging, author submission; Naming, repositories (Kahn & Wilensky, 1995), archives; Spaces (conceptual, graphical, 2/3D, VR); Architectures (agents, buses, wrappers/mediators, interoperability); Services (searching, linking, browsing, and so forth); Intellectual property rights management, privacy, protection (watermarking); [and] Archiving and presentation, integrity” (Joint Task Force, 2001, p. 140). This specification of a digital library course served us as an early starting point; these topics were incorporated into our initial curriculum framework, which had 19 topic groups (Pomerantz, Wildemuth, Oh, Yang, & Fox, 2006b). 5S Framework: A formal model and theory developed to describe digital libraries in particular, but more generally able to aid description of information systems; the basic elements, describable using well understood mathematical constructs, are: societies, scenarios, spaces, structures, and streams. Architecture: How a digital library system, system component, or federation of systems is constituted or organized to operate. Digital Librarian: An information professional responsible for the design, development, and/or maintenance of a digital library, including both its collections and the services it offers to its users. Curriculum: A set of courses constituting a particular area of specialization. Interdisciplinary Curriculum Development: The development of a curriculum or curriculum framework jointly undertaken by collaborators from two or more academic disciplines. For example, in this case, this effort is undertaken by collaborators from computer science and from library and information science. Module: A unit of educational content and content description that can be worked with, relative free from dependency on other similar units of content—typically a part of a course. Digital Library (DL): A complex information system that can be described using the 5S framework, with parts: digital object, metadata object, catalog, repository, index, user, user interface, and services (including search and browse). Digital Object: An electronic document, multimedia content item, or representation of information in computer form (i.e., made of 0s and 1s)—the basic unit of what is stored in or taken out of a digital library. Metadata: A set of information about a digital object, serving needs such as content description and administration.